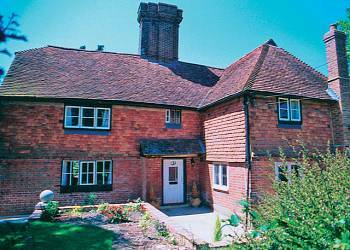 Forest Farmhouse is an impressive 16th century detached farmhouse situated in the village of Buxted in East Sussex. It has three bedrooms (2 doubles and 1 twin room) and can therefore sleep up to 6 people. Sorry no pets allowed. It features a wealth of original features including an inglenook fireplace, beamed ceilings and there is even an original bread oven in the kitchen. The ground floor consists of a lounge, dining room, study and kitchen, as well as a separate toilet. Some steep stairs lead upstairs to the three bedrooms and separate bathroom. One of the bedrooms has an ensuite bathroom as well. The house is set in a large enclosed garden, which contains garden furniture and a barbeque for enjoying some alfresco dining. There is also off street parking available. The house has full gas central heating in additional to an open fire and woodburner stove.